Discover this month’s best happenings around Dubai, from dining and shopping spots to where to work out and unwind. Inspired by the nourishing feeling evoked by travel, ‘Les Parfums Louis Vuitton’ are fragrances that recall the journey of emotions. Available globally as of September 1st, this collection of scents led master perfumer Jacques Cavallier Belletrud all around the world to perfect it. It spans seven fragrances from the airy and silky soft ‘Rose des Vents’ to the shadowy metamorphosis of ‘Matière Noire’. Street Life DXB is offering residents the opportunity to uncover the “real” Dubai through a three-day series of events that includes a Deep Like electro performance on Thursday night, an urban-art sketching day in Deira on Friday afternoon, and the chance to get inspired by the work of regional artists in Dubai Design District on Saturday afternoon. Find out more, here. Have a closet full of clothes you were hoping to get rid of? Dubai Flea Market is where you should spend your Friday. You’ll have the opportunity to buy and sell everything from antiques and home appliances to furniture and books from 2 p.m. to 6 p.m. in Zabeel Park. Click here for more information. To celebrate its grand opening, Yoga House Dubai is offering free yoga classes and complimentary strawberry lotus jars on September 2nd and 3rd, as well as a 50 percent discount on all classes from September 4th to 8th. Find the full schedule, here. The Lululemon store in Mall of the Emirates will be offering a complimentary class taught by Dubai-based yoga instructor and light worker Natalia Fata from 8:30 a.m. to 9:30 a.m. Click here for more information. With pieces that are delicate, minimalist, and crafted from the highest-quality materials, Donna Hourani Jewelry is a brand dedicated to the art and finesse of creating honest jewelry with unique stories. Composed of hand-picked and ethical, natural gemstones, the collection can be viewed at the brand’s upcoming trunk show from 4 p.m. to 8 p.m. at the Faux office located in Dubai Design District. Head to A4 Space in Alserkal Avenue from 10 a.m. to 7 p.m. to shop sneakers and accessories from premium Middle Eastern streetwear retailer Upclassics. Click here for more information. Dubai’s newest upscale shopping haunt, a 25,000-square-foot mall known as The Outlet Village, has just opened its doors. Modeled after the Tuscan town of San Gimignano, which is best known for being a UNESCO World Heritage site due to its magnificent medieval architecture and unique tower houses, it features 120 prestigious stores and is located between Dubai and Abu Dhabi. It’s Thursday night, so grab a seat at one of our favorite new haunts, Miss Lily’s Dubai or Muchachas. The latter is the fifth concept by culinary masters Tom Arnel and Sergio Lopez and serves up delicious plates of contemporary Mexican cuisine. Best for sharing, the dishes on the menu include grilled flank-steak tacos, super cheesy queso fundidos, and spiced devil prawns and pineapple. This market experience includes local artisans, speciality food outlets, and organic fruits and vegetables aplenty. Head over to Ripe Market every Saturday at Times Square Center from 9 a.m. to 3 p.m. to sift through a variety of products from organic skincare and leather bags to handmade jewelry and rustic houseware. With Eid Al Adha scheduled to fall on September 12th, stay tuned for Savoir Flair’s holiday travel guide to help you decide exactly where to jet off to. And if you plan to stay in town, this extended weekend is a great time to visit IMG Worlds of Adventure. The world’s largest indoor theme park, it is equivalent in size to almost 28 football fields and has finally opened its doors in Dubai. Book your tickets now. Performed by The Russian State Ballet and Orchestra of Siberia, this captivating ballet performance is coming to Dubai’s newly opened opera house. Showing on both September 15th and 17th, Coppélia is a family ballet that tells the story of Franz, a young village boy who becomes infatuated with a life-size doll created by eccentric toy maker Dr. Coppelius. On Friday, enjoy Giselle, which is considered to be one of the greatest romantic ballets of all time. It tells the tale of a peasant girl who dies of a broken heart after she discovers that her lover is betrothed to another. Lebanese fashion powerhouse Elie Saab and MBC have teamed up to produce Project Runaway Middle East, which will see Saab and a small jury of fashion experts provide guidance to aspiring designers from across the region. 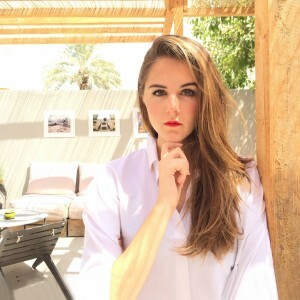 Dubai’s very own Lebanese-Australian model Jessica Kahawaty will host the show. Stay tuned! Iraqi artist and painter Hayv Kahraman debuts her fourth solo show, Audible Inaudible, in Dubai at The Third Line today. Meanwhile, British-born Chinese artist Gordon Cheung’s first solo exhibition in Dubai, Lines in the Sand, begins at the nearby Leila Heller Gallery. Find out more about the art exhibitions that we’re looking forward to, here. This American YouTube personality, vlogger, actor, and rapper from New York City is best known for his viral videos that – thanks to his almost three million subscribers – have led him to appear on The Ellen Show, the BBC, and more. This is the first time that Adam Saleh will be performing in Dubai. For more information, click here. Enjoy an evening filled with art, design, and music as well as the opportunity to browse Alserkal Avenue’s finest galleries from 6 p.m to 9 p.m. Gallery tours will also be available beginning at 6 p.m. at A4 Space. Click here for more information. The world’s best illusionists will perform everything from death-defying stunts to close-up magic from September 26th to 30th during Impossible at Dubai Opera. Guaranteed to be mesmerizing, the performance comes to Dubai fresh off its successful run in London’s West End. Click here for more information.